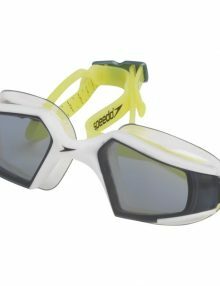 Colour: White/Silver Product Detail: Speedo mirrored fitness goggles featuring IQfit technology. Optimum leak resistance and secure fit. Lens: PC. Seal: TPR. Wishbone: TPU. Strap: Silicone. Anti-fog coated lens for excellent vision and clarity. Wide-vision lens provides uninterrupted peripheral vision. IQfit tension scale on strap to ensure a secure fit every time.